We are all vulnerable to addiction. Whether it’s a compulsion to constantly check social media, binge eating, smoking, excessive drinking, or any other behaviors, we may find ourselves uncontrollably repeating. Why are bad habits so hard to overcome? Is there a key to conquering the cravings we know are unhealthy for us? 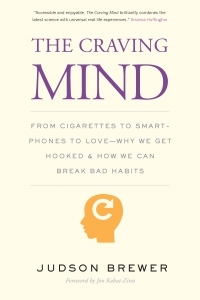 This book provides groundbreaking answers to the most important questions about addiction. Dr. Judson Brewer, a psychiatrist and neuroscientist who has studied the science of addictions for twenty years, reveals how we can tap into the very processes that encourage addictive behaviors in order to step out of them. 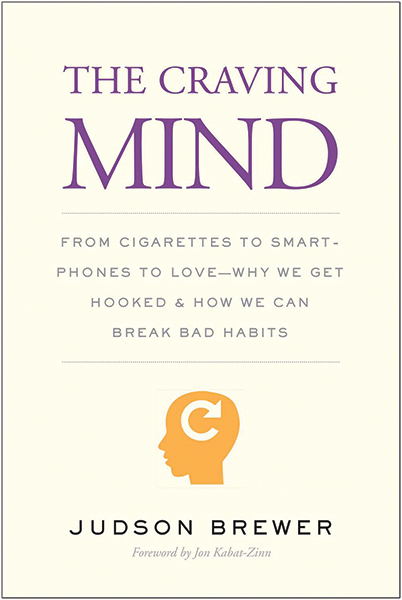 He describes the mechanisms of habit and addiction formation, then explains how the practice of mindfulness can interrupt these habits. Weaving together patient stories, his own experience with mindfulness practice, and current scientific findings from his own lab and others, Dr. Brewer offers a path for moving beyond our cravings, reducing stress, and ultimately living a fuller life. Judson Brewer, M.D., Ph.D., is director of research at the Center for Mindfulness and associate professor in medicine and psychiatry at the University of Massachusetts Medical School. He is also an adjunct faculty member at Yale University and a research affiliate at Massachusetts Institute of Technology.